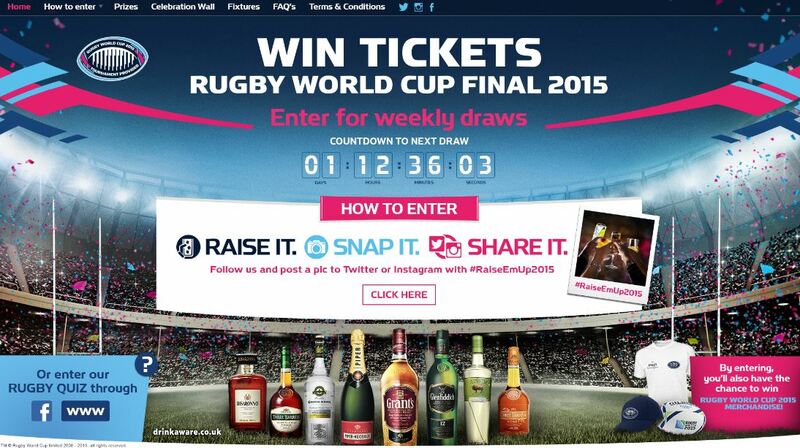 William Grant & Sons UK launches #RaiseEmUp2015, a campaign which will give fans the chance to win Rugby World Cup 2015 tickets and exclusive merchandise at participating bars and stores. The promotion asks entrants to ‘Raise it, Snap it and Share it’ by ‘raising a glass’ in support of their team and sharing it as a tweet or Instagram image using the hashtag #RaiseEmUp2015. The campaign will run across Twitter, Instagram, Facebook and on http://www.RaiseEmUp2015.com with 40 pairs of tickets to be won, including two pairs for the Final at Twickenham on 31st October. Draws for winners will take place on a weekly basis giving away tickets to group matches, quarter-finals and semi-finals*. Tickets to the Final at Twickenham stadium will be drawn on October the 20th. Each week, merchandise including t-shirts, caps and Gilbert mini rugby balls will also be given away as prizes. Consumers in participating bars will be given a “Snap & Win” card when they purchase a drink from the William Grant & Sons UK portfolio of brands for a chance to instantly win branded merchandise. The campaign will be communicated via 3000 #RaiseEmUp2015 promotional kits that will go into selected bars and in stores the campaign will be communicated via 600,000 neck collars on participating William Grant & Sons UK brands. With Rugby World Cup 2015 on track to be the biggest and most viewed to date, this ticket offering is sure to engage new and existing audiences with this incredible Tournament and William Grant & Sons’ UK portfolio of premium brands. The campaign microsite http://www.RaiseEmUp2015.com is live from 24th August for fans to share their best entries.